In this exciting sequel to Rarer Than Rubies, gay romance author Trent Copeland and former FBI agent Reed Action head to Italy for a Roman holiday. What should be a relaxing and romantic vacation is interrupted when Reed’s not-so-former boss asks for his help with a case. Trent's shocked to discover in the six months they’ve been living together in LA, Reed hasn’t been completely honest about his "retirement." There’s nothing quite like getting called in to work while you’re on vacation halfway around the world from home—but if you’re vacationing where the work is, goodbye sightseeing. Reed’s phone goes off while he and his lover Trent are exploring the Vatican museums, and that’s the end of fun in Italy. Reed and Trent got together in Rarer than Rubies, and if you don’t care to start with an established couple, definitely read that first. (Read it anyway, it’s good.) These two are on much shakier ground than either of them believe, so if you don’t mind catching up on the history as you go, this also stands alone. The reveal of the backstory is nicely done and doesn’t go beyond what’s needed to enjoy this one. Trent’s shattered to find out how much Reed has kept from him all this time; while he doesn’t expect to hear every detail, something as big as still being an active agent ought to get mentioned. Given that Reed had a personal relationship with his old partner Peter, and that Reed’s never really told Trent much about this part of his past, this new mission has the potential to cost them their relationship. The writer in Trent has to pick at the mystery and follow the clues: he was deeply if accidentally involved in the Ruby Buddha affair in Thailand in the first book, and a visit to an antiquities auction puts him in the middle of Reed’s newest mission. The volatility of their feelings mixes with the danger Reed’s walking into, and Trent cannot just sit back and let Reed go. At every turn Trent’s somehow mixed in, and very often he has a critical insight or action that makes it possible for Reed to pick apart the mystery. It’s a lovely dance, this mix of educated novice and professional, and critical to their ultimate success. The men have a lot of differences in tastes and philosophies, and some very different ways of seeing the world. They manage to meet in the middle in ways as side effects of everything else they are involved in, which is very deftly done. 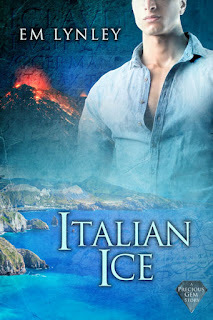 The setting, starting in Rome and moving to the volcanic isles of Sicily, is very nearly a character too. EM Lynley makes us smell the volcanic fumes, feel the ocean spray on our faces, taste the fresh from the sea food, and occasionally smell the alleyways. Once in a while it’s a little guide-booky, but the author clearly loves this region and makes us feel it too. Smatterings of Italian streak the pages, and the local proverbs for chapter headers add a nice touch. I loved Trent, although I did occasionally get aggravated with his focus on relationships rather than the external dangers—romance writers do stay on topic. I also liked Reed, and sometimes wanted to shake him over matters of honesty in his relationships; he’s willing to let 800 lb gorillas sit in the living room for long periods. However, the two men and their needs interwove tightly with the smuggling plot, and the finale brought everything together with a giant crash and wrap. The smuggling plot had layers on layers, with smiling villains that didn’t go over the top. The stakes were high but not ridiculous, the evil bad but dedicated to achieving specified ends. The odds were stacked deeply against Reed and Trent, but on a scale that was difficult, not absurd. Overall, a good balance. The epilogue was the weakest section, bending belief in Reed and restaurants, and leaving me wanting to choke one minor character with a piece of bruschetta. Fortunately, the main story already left me confident in Trent and Reed’s solidification as a couple.